Distinguish the front of your mailbox from everyone else's on your street with the Whitehall White and Gold Personalized Mailbox Door Panel. Each panel is hand cast in recycled aluminum from a mold created specifically for your order, giving you a beautiful marker in a single, durable piece. Sized and fitted specifically for use with the Whitehall White Deluxe Mailbox (not included), this accessory sign will add a beautiful accent to your curb. The gold characters contrast the bright white background, for a noticeable house number, as the panel may be personalized with up to five 1.75" characters. Use the included hardware to attach it to the front of your mailbox. 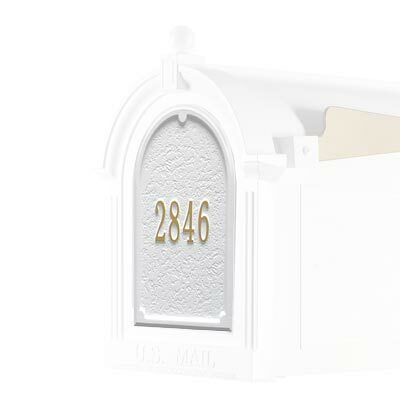 The White and Gold Personalized Mailbox Door Panel will clearly display your house number year after year. Made in the USA.